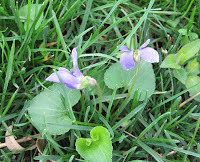 Two violets talking in the garden. Management here at the May Dreams Gardens Home and Tea Room for Antiquarian Garden Books (MDGHTRAGB) has decreed that no more old gardening books will be admitted to the home or even allowed to come to high tea until such time as additional shelves are obtained to house those books that have taken up residence on the floor of the dining room. An exception is being made for two books that are currently en route to the home and tea house, having been ordered rather spur of the moment on Friday. But after those two books arrive, that's it. No more books until there are more shelves to hold them. Or some books which do not necessarily meet the criteria for residency here at the May Dreams Gardens Home and Tea Room for Antiquarian Garden Books (MDGHTRAGB) need to be evicted to free up space for those gardening books that do qualify to be in residence. 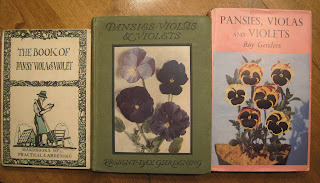 Because it is neither possible nor practical to own all the world's old gardening books, management is limiting acquisitions to those books that are older than Carol, with a decent cover, and a reasonable price. The books should somehow relate to some aspect of gardening that Carol is interested in and should generally be written in English. Management has asked that Carol list those aspects of gardening that she is interested in, but she has yet to do this, fearing, of course, that it will be used to keep her from purchasing an old gardening book "because it has a pretty cover" but isn't about an aspect of gardening on the list. Preference is given to those books by authors that Carol already has a book written by, though if a new author should come along, it is possible that Carol will try to corner the market and find at least one copy of every book written by that author. Thus, she does own a copy of each and every book written by Ida D. Bennett and most recently acquired all three books written by Alice T. A. Quackenbush. Reprints are not welcome here at the May Dreams Gardens Home and Tea Room for Antiquarian Garden Books (MDGHTRAGB) because they lack the charm and intrigue of actual old books that may contain notes or newspaper clipping in them, long ago tucked between pages 53 and 54 by some previous owner. As noted by several recent acquisitions, Carol is also willing to buy more than one book on a particular aspect of gardening. 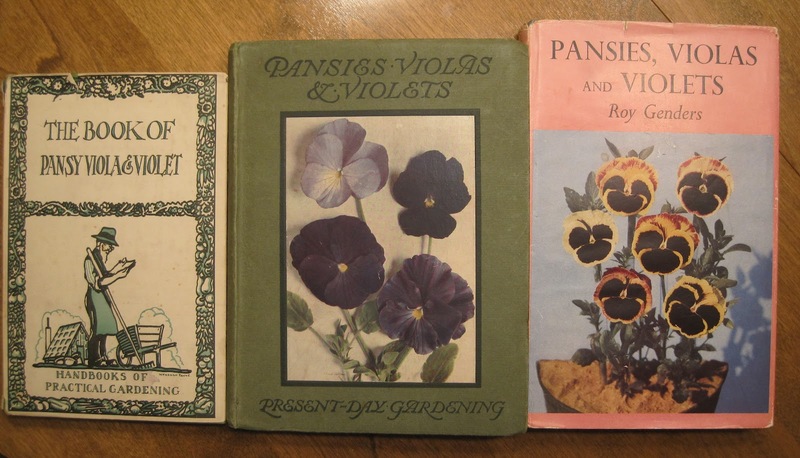 I've cornered the market on Violaceae related books. 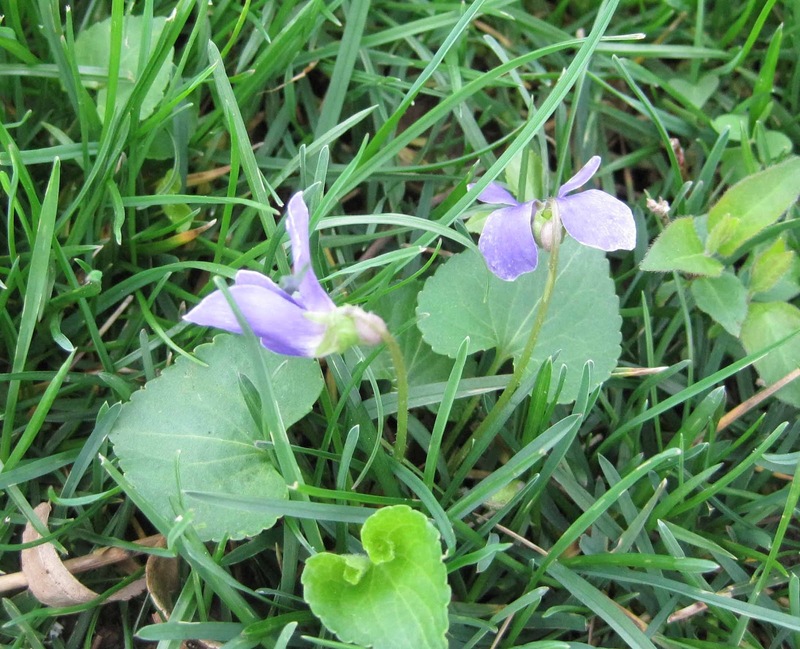 Management does not exactly understand why Carol needs The Book of Pansy Viola & Violet and Pansies, Violas & Violets and Pansies, Violas, and Violets. They await further explanation on this. When asked why she continues to buy old gardening books Carol responded, "When I buy old gardening books, I feel like I am rescuing them, giving them new life, bringing them into the light, or at least giving them a place to rest on the dining room floor." Management was encouraged to realize that at least Carol recognizes that there are no more shelves and the books are now taking up floor space. In the meantime, they are looking for additional shelf space as it does not appear as though Carol is planning to stop purchasing or rescuing, as she refers to it, old gardening books and bringing them here to May Dreams Gardens Home and Tea Room for Antiquarian Garden Books (MDGHTRAGB) to take up residence. A very happy Easter to you and yours, Carol. May your new shelves fill quickly, freeing up more space on the dining room floor. Remember,rules are meant to be broken. I hope you break this new one. One cannot have too many books. My suggestion? Turn that dining room into a library! After all, which do you spend more time doing, dining formally or reading? Or, a small dining table in the center surrounded by books on all sides! Maybe invent a table that turns into a recliner???? Older than Carol? WOW, that's OLD! I've often ended up in the "bargain bin" of antique book stores, rescuing perfectly lovely books from an unknown but probably dreadful destiny by buying them and giving them a loving home. I collect old girl detective novels. There's definitely something about old books. They even have their own smell! I recommend building more bookcases.